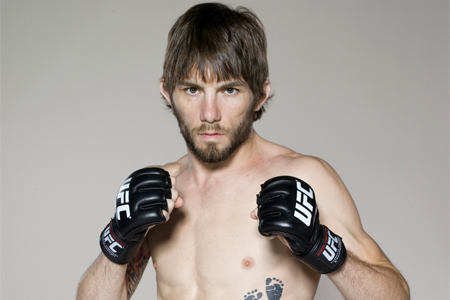 On Friday, a bantamweight brawl between Johnny Bedford (Pictured) and Nick Denis was added to the “UFC on FOX: Diaz vs. Miller” lineup. The 135-pound affair marks the 11th scrap confirmed for the May 5th event. It’s possible the organization could announce a 12th bout to the roster at a later date. Bedford made his big league debut by posting a TKO victory over Louis Gaudinot at “The Ultimate Fighter 14 Finale.” He was slated to face Mitch Gagnon at “UFC on FOX 2,” but his opponent was forced to withdraw just three days before showtime because of visa issues. The UFC’s third show on FOX takes place inside IZOD Center in East Rutherford, New Jersey. A five-round affair between Nate Diaz and Jim Miller headlines the festivities. A welterweight shootout with Josh Koscheck and Johny Hendricks will serve as the co-main event.